In the end, I decided to just choose five ships that illustrate interesting details about blockade running during the Civil War. If you’d nominate other runners, leave me a comment with the story! 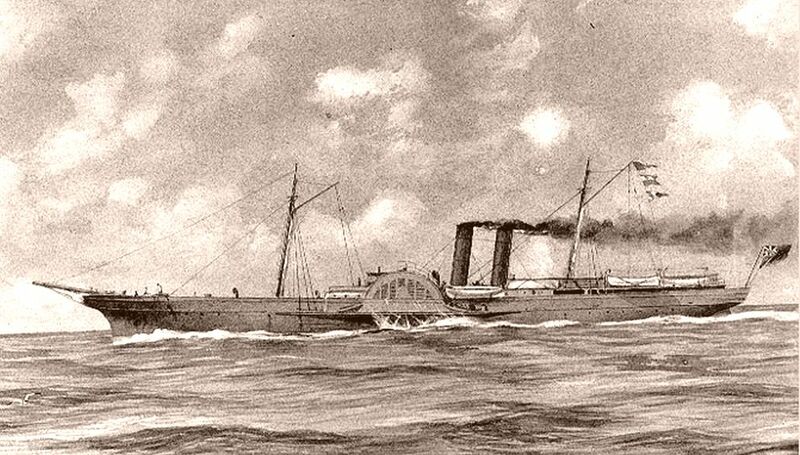 Just to review… A blockade runner during the Civil War was an unarmed merchant ship (not a raider, not a cruiser), attempting to evade the Union patrol ships to slip in or out of the Confederate ports exporting cotton or importing armament, other military supplies, or luxury items. The Syren definitely qualifies as a famous blockade runner. Why? She made thirty-three successful runs! Owned by the Charleston Importing & Exporting Company, the Syren was their only ship; the company boasted that with a ship that successful, they didn’t see the need to invest in another vessel. With a daring captain and crew who didn’t wait for tides or dark nights, she made legendary multiple trips while other blockade runners waited in harbors for “favorable” conditions. It might have seemed like this ship was invincible, but the Syren was captured in February 1865, actually in Charleston Harbor. The Confederates tried to set the ship on fire to prevent the Union troops from capturing it and the supplies, but they managed to extinguish the fire, captured the vessel, and eventually turned her into a U.S. merchant ship. Built in Scotland and purchased by the state of North Carolina to serve as a blockade runner, the Advance sometimes had unique name spelling – A.D.Vance, but the correct spelling as listed in the harbor records is “advance.” However, the name was spelled, this ship also had a record number of runs – twenty successful venture! She was captured on September 10, 1864, offshore from Wilmington, North Carolina. Following typical proceedings for captured runners, Advance was auctioned in a prize court; she was purchase by the U.S. Navy and renamed the USS Frolic. Named for the character in an 18th Century novel, the Tristam Shandy blockade runner was built in the United Kingdoms for the Anglo-Confederate trading company. The ship was known for its great speed and the newer technology of an iron paddle wheel. On May 15, 1864, Tristam Shandy was captured. Converted into a U.S. blockader, the ship’s history has a twist of irony. She successfully captured other blockade runners! 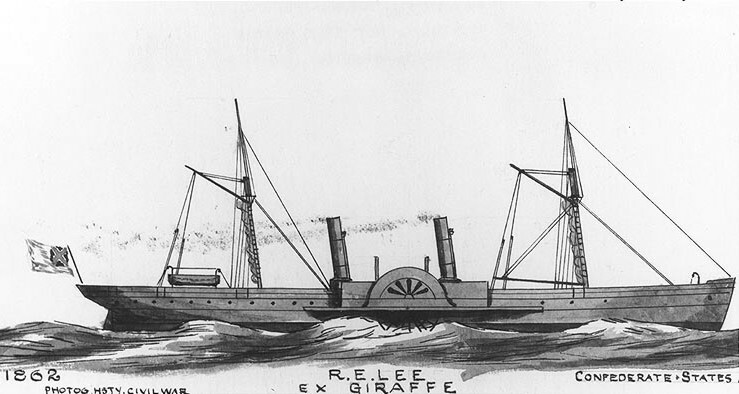 The Confederacy paid 32,000 British pounds for this ship which was originally called the Giraffe. Rechristened Robert E. Lee when the ship arrived in the South in late December 1862. The ship became legendary for its speed and completed twenty-one voyages in ten months; on one voyage, the ship hauled Confederate navy officers and $35,000 of gold to Canada. On November 9, 1863, Robert E. Lee was captured. The ship was later sold and commissioned in the U.S. Navy as the USS Fort Donelson, helping to enforce the Union blockade and firing during the attacks on Fort Fisher which eventually closed Wilmington’s port and basically ended effective blockade running. In April 1863, the Banshee was the first steel hulled ship to cross the Atlantic! This vessel was privately owned but the Confederate government hired it to transport armament from Bermuda and the Bahamas. Captured on November 21, 1863, Banshee was eventually sold and converted to a U.S. warship.